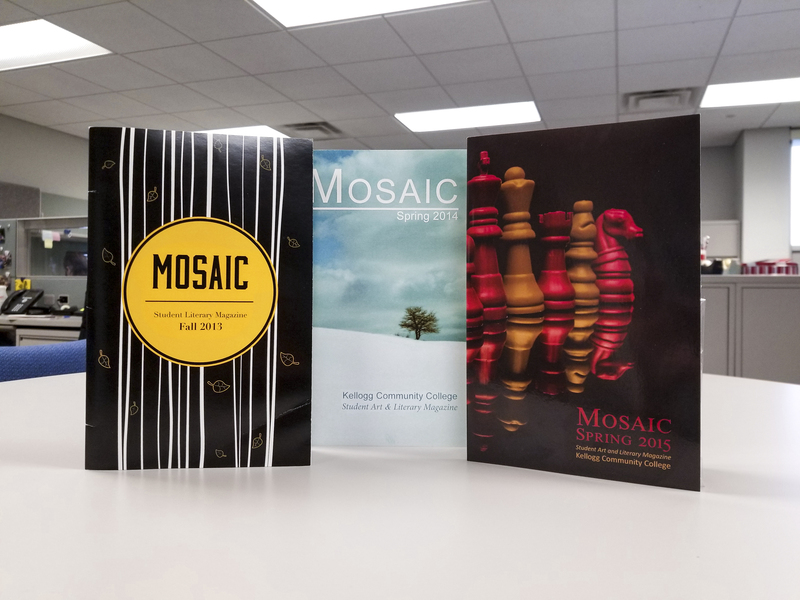 Kellogg Community College is currently accepting submissions for consideration for publication in Mosaic, the College’s student art and literary journal that is published each April. Students are allowed to enter up to TWO original works of art created while attending KCC in the past 12 months. Photographs, drawings, paintings, designs, collages or mixed media works are all accepted, however submitting artwork produced for high school or other institutions is discouraged. The top 25 submissions will be selected by the KCC Student art group, Art League. There will be prizes awarded and announced during the Mosaic release party in April. Submissions must be in black and white or color and include enough contrast and graphic power to reproduce well when printed smaller in roughly a 9- by 6-inch magazine page size. Regardless of art medium, make a quality scan or photo reproduction for email submission. See art faculty, staff or a work-study student should you need assistance with this process. Entries must be 300 ppi resolution JPG files and labeled: First & Last name, K-ID#, Mosaic Entry# (for example, John_Doe_K0095363_Mosaic_1). The deadline for submissions is Friday, Feb. 16. Please email submissions to Photography & Multimedia Art Professor Ryan Flathau at flathaur@kellogg.edu.